Materials provided by Oriental Trading. 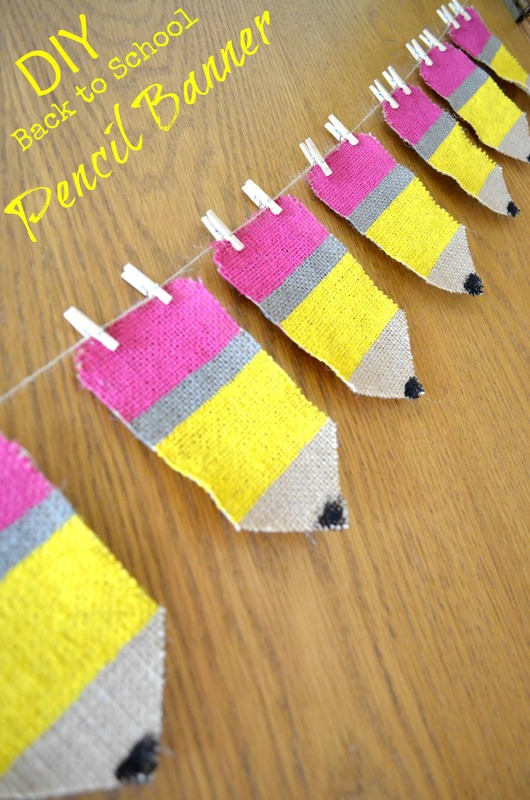 Thanks to Oriental Trading & some of my free printables (you can find below!) 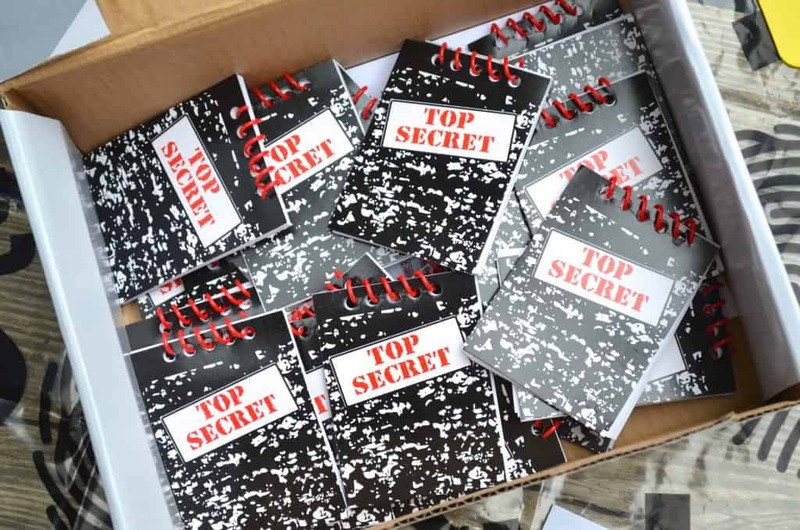 we’ve put together a pretty cool Spy Themed Classroom Time Capsule idea that will really get your students excited to be back at school! 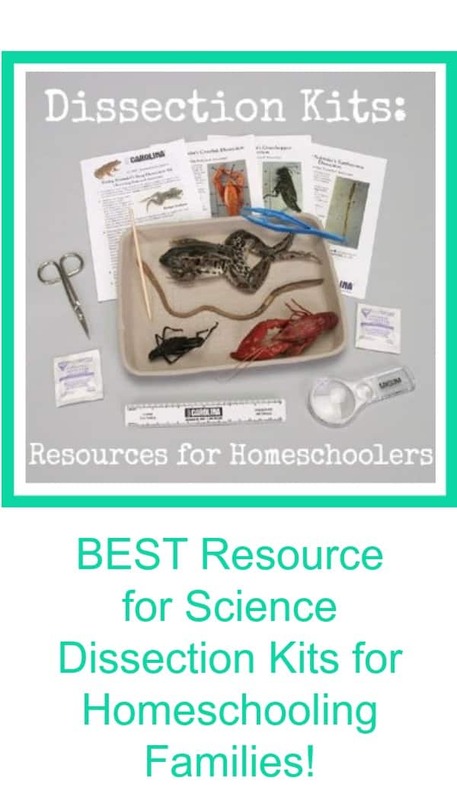 You can tweak it to fit your needs if you’re a homeschooling family or if you REALLY want to go the extra mile and hide your time capsule outside somewhere in a waterproof container. Spend as much or as little time as you have putting together your own time capsule. 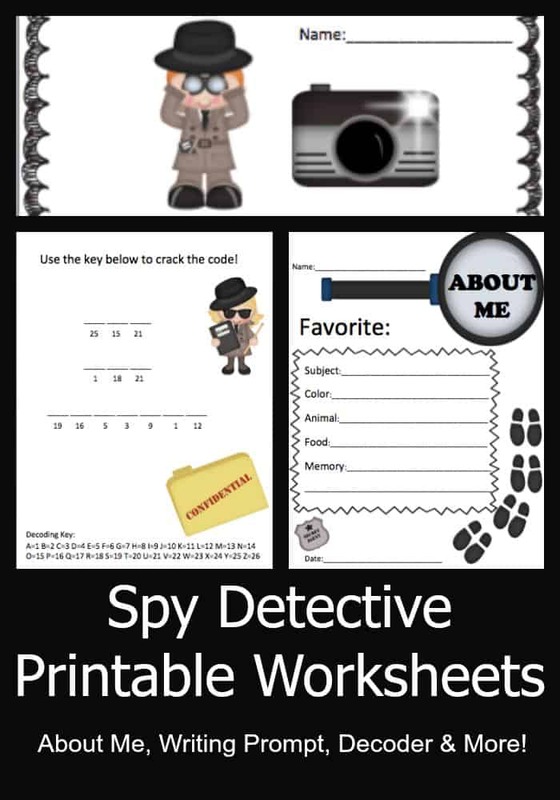 You can spin the spy theme into SO many ideas from investigating fingerprints to see if they’ve changed at the end of the year to letting the kids write themselves secretive messages they’ll forget all about until they decode them! How about putting some partially inflated balloons in your time capsule and investigate them at the end of the year to see if they’ve deflated or not. Or tiny pieces of their hair into envelopes that they can look under a microscope at the end of the school year! Start out with your Time Capsule box and your pile of TOP SECRET notebooks! Inside the notebook they can write their names, favorite summer adventures, drawings, secret messages, and even notes to the teacher! Have the kids write themselves a note to read at the end of the school year. You can also “stamp” their fingerprints into this book. Every day the first week of school ask a simple question the kids can write into their books such as their favorite foods, summer memory, school subject, etc. 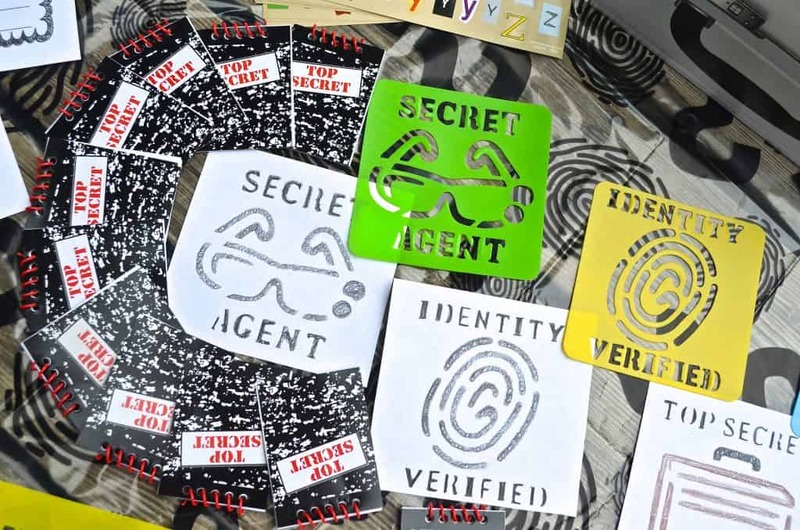 These Secret SPY Stencils are great for keeping the kids busy while others are working on their notebooks! Have them color the stencils onto a brown paper bag if you are doing an investigative nature scavenger hunt where they can take their materials home. 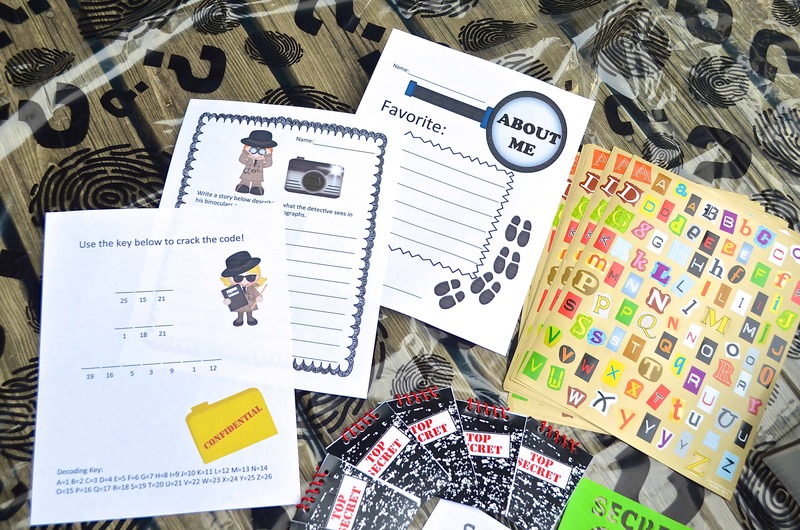 You can also print out our FREE Spy About Me Printable set which includes a writing prompt, an “About Me” page and even a secret decoder message with an extra page to make your own decoded message! These Ransom Note alphabet letter stickers are SWEET too. Let the kids use them to decorate on their “About Me” papers one word that describes them or how they feel about the school year. 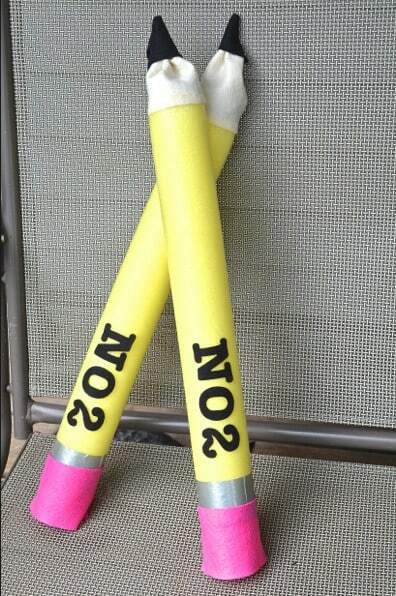 OR let the kids create a message that they have to guess who created it at the end of the year! Wrap up your time capsule box in this plastic spy tablecloth and Investigation in Progress tape to make it official and hide the box until the end of the school year. 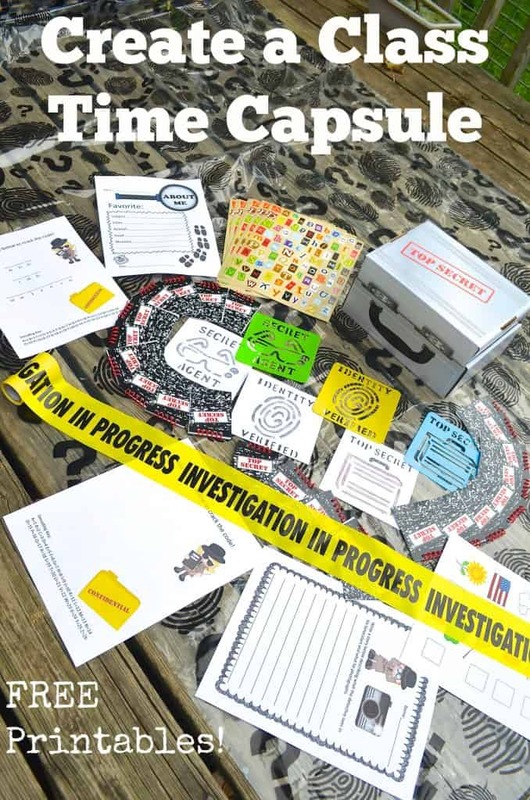 You can even have a spy “steal” your time capsule leaving clues behind the entire year if you’re extra creative and spin all sorts of investigative activities around it throughout the year. Once the school year is coming to an end pull out those magnifying glasses and search for your time capsule! Open it up and see how much the students have learned and grown during the year!